AnaesthesiologistTreating and advising in pain management anaestehesia, acute- and intensive care problems. Visiting a patient is often a best solution for the patient. We're specialized in acute and chronic pain management. We do housecalls in the general Turku area. At Saaristomeri, help is often far away, and the patient's demand for treatment may be difficult to meet. Our doctor boat can bring help quickly just where you need it. Anaesthesia involves the management and removal of sensation of pain during a surgical procedure. Anaesthesiological pain management consists of general anaesthesia, in other words, sedation and anaesthesia such as spinal, epidural and plexus blocks. General anaesthesia consists of three parts; removal of sensation of pain, sedation and relaxation of muscles. As anaesthetic methods has envolved, the likelyhood of side-effects have lessened, which has made it possible to care for seriously ill individuals in a safe manner. 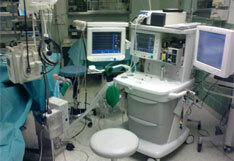 Surgery and sedation always include careful monitoring of basic life-functions. Common side-effects of anaesthesia includes nausea, throat pain, fatique and itching. More unusual side-effects include difficulty to urinate, airway infection and worsening of chronic illness. An experienced anaesthesiologist can offer a safe and pleasing anaesthesia while preventing possible side-effects in an efficient manner. Pain can be categorized into nociceptic, ischemic and neurological pain. Nociceptic pain, or pain arising from damaged tissue, is for example "shallow" pain from a skin incision or "deep" pain from skeletal muscles, supportive tissues, bones or joints. Ischemic pain arises due to insufficient levels of oxygen in bodily tissues. This due to low levels of oxygen activating the nerve endings. Neurological pain can arise for example if a nerve is pinched or if a cancerous tumour has spread into nearby neural tissue. The sensation of pain can vary widely; pain can be slight or strong, stabbing or dull, burning or spasming. If the sensation of pain is strong and ongoing it should be investigated further and strong pain medication should be started at once. It is also noteworthy that powerful analgesics can mask a serious medical condition and that ongoing pain can turn into a chronic condition. Effective and safe pain managment is one of our more important areas of expertise.